I clip coupons. There, I said it. It's funny the different reactions I get when I tell people that. They either look at me with an incredulous look and ask, "Do you really save money?" Yes, I do. Or they smile and say, "Me too!" like it's a club we both belong to. There is a website called, Coupon Mom. If you click on the best grocery deals by state, they will give you a listing for the items at your grocery store that are on sale and have a coupon. Coupon Mom is free unlike other coupon sites. And that is how you save money. By buying the items that are on sale and that have a coupon. I shop for groceries two weeks at a time. The last time I shopped my total was $234.71. But after my coupons it came to $181.92. I saved $52.79 by shopping the sales with coupons! Last night Madison's middle school had their academic achievement night. 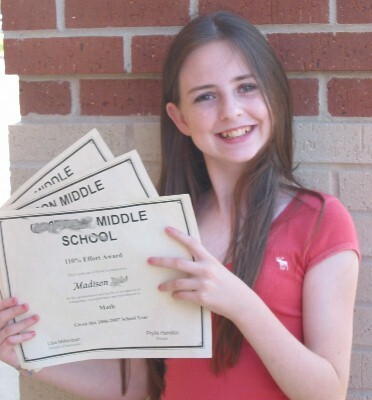 She was awarded certificates in Math, Science, and Language Arts. She's a smart one! I think the whole coupon thing is awesome. I wish we got a news paper or direct mail coupons because they totally add up when you use them together. One of my mom's favorite site has all sorts of crazy deals for online shopping and has all sorts of coupons and tricks for how to use your coupons. I've been really getting into it. i clip coupons too. the cashiers at the grocery store are always impressed with how much i save between sales & coupons. they usually comment on it when it prints out on the receipt! Madison gets her smarts from my side I think. hahaha. I wish I cut coupons but I just find myself throwing them away and never looking back. It may be a pride issue for me, but that's also stupid of me because the money I could save with coupons, could go towards clothes or shoes, or IKEA since it opens next week. Yeah maybe I should try it. but then they float around my purse forever and they frustrate me so I end up throwing them away anyway, and by all means I am not going to be that lady that has the accordion file with all of her coupons filed away. maybe it's just not for me. but good job on saving money, I expect big gifts from you from now on with your savings.